Note: Today, the 15th, is the Ides of March, signifying that the Vernal Equinox and March Madness will kick in next week and that your IRS returns are due a month from today. 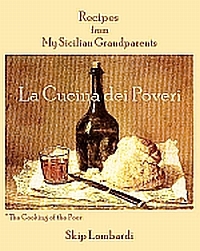 We first published this recipe in our other blog, Almost Italian, on October 12, 2007. This was a favorite among the supper club crowd during the 1950’s, when tableside preparations were the rage from coast-to-coast. Head waiters in tuxedos relished the opportunity to make this salad as theatrical as anything the French had ever flambéed. Technically, Caesar Salad would never have gotten a Green Card, let alone qualification as Italian-American, had its creator not been a bona fide Italian. Emigrating from Baveno, in the lake district of northern Italy, Cesare Cardini arrived in America in 1913. Within a few years, he had opened a restaurant just south of the California border in Tijuana, Mexico. It was there that he invented the salad that bears the revised spelling of his name, not that of the Roman emperor who dallied with Cleopatra. Initially, the Hollywood patrons of Caesar’s Palace, Cardini’s first restaurant in Tijuana, came to take a break from Prohibition; but they were soon coming back for Caesar Salad. And it wasn’t too long before Caesar Salad began to appear on the menus of neighborhood Italian restaurants all over North America. While Mr. Cardini’s salad contained several ingredients unusual for the period, like Worcestershire sauce and Parmesan cheese, the most unusual were the toasted croutons. One tale of the salad’s origin suggests that on the Fourth of July, 1924, Ceasar’s kitchen was running low on vegetables. Mr. Cardini is said to have gathered armloads of whatever was available, putting everything on a cart which he wheeled into the dining room. There, he began making this salad in full view of diners. Among his hastily gathered ingredients, were garlic-flavored croutons that had probably been destined to garnish soup. The original salad didn’t include anchovies, but we have a clue as to how they eventually found their way into the standard Caesar Salad: Worcestershire sauce may contain many exotic flavor enhancers, like tamarind, asafoetida, cloves and—guess what—anchovies. I happen to love anchovies, so I have included them in my recipe. Anchovies turned out to be among the more subtle subversions of Caesar Salad. 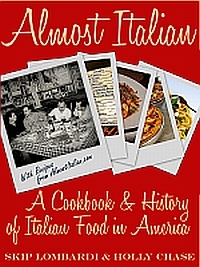 Over the course of the 1980’s and 90’s, Italian-American chefs have pushed, prodded, and shoved additional ingredients into and around the salad. Blackened Chicken Caesar Salad, Grilled Tuna Caesar, Shrimp Caesar, Tofu-topped Ceasar, Caesar Burgers, and even Caesar burritos no longer raise eyebrows when they appear on upscale and fast-food menus. During the 1990s, the California Department of Health banned the sale of Caesar Salad made with eggs. That regulation was suspended in 1998 when food scientists presented convincing evidence that coddling eggs, or dipping them into boiling water for 40 – 45 seconds, killed any lurking bacteria. If you do use eggs when making the dressing, please don’t omit this step. 2 cups French baguette slices cut into 1-inch cubes. Combine the garlic, a few grindings from the pepper mill, and bread cubes in a bowl. Mix until seasonings cling evenly to cubes. Drizzle the olive oil over the cubes, stirring gently with a spatula. Spread the seasoned bread cubes on a sheet pan and bake until the croutons are golden, approximately10 minutes. Rub the inside of a wooden salad bowl* with the garlic halves, covering the bowl as evenly as possible. Discard the remaining garlic. Add the optional anchovies, and mash them with the back of a fork, while stirring to coat inside of the bowl as well. Add the Worcestershire sauce, lemon juice, salt, pepper, and mustard. Stir well. Crack the coddled egg into the bowl and beat vigorously with the back of a fork until all ingredients are well mixed. Slowly add the oil in a steady stream, stirring constantly, until the mixture is smooth and the dressing begins to emulsify. Tear the Romaine lettuce into 2-inch pieces. Add them to the salad bowl and toss to coat them with the dressing. Add the Parmesan and croutons and toss the salad again. Serve immediately on chilled plates.